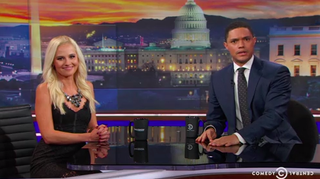 Tomi Lahren, who some call the second coming of Ann Coulter—just more racist and annoying—appeared on The Daily Show Wednesday night and got into a heated debate with Trevor Noah over topics like Black Lives Matter and Colin Kaepernick. Noah brought up not only the fact that Lahren is considered a racist but also her criticism of Kaepernick's national anthem protest, and her ridiculous views about Beyoncé's Super Bowl performance. “For somebody who is not racist, you have to spend a lot of time saying, ‘I’m not racist,’” Noah told Lahren. Yeah, famous racists' last words are usually that they don't see color or they have black friends. On the subject of Kaepernick, Noah wanted to know why Lahren took offense to his protest. Lahren agreed that he has the right to protest, but also said that she shouldn't be criticized for not agreeing with it. “So because I don’t agree with what he did, I should shut up because I’m white? I should shut up? I shouldn’t be able to talk about black issues because I’m white?” Lahren said.